The graphic in the area Forecast and Recommended Action gives an overview of the expected PV power as well as recommendations on the manual switching-on of loads. In addition the graphic shows the time periods that you have planned for the operation of the loads. You can have a forecast displayed for up to 48 hours from the currently selected time. During these times you can for example vacuum, and therefore operate the vacuum cleaner using cheap electricity. The location of the system must be set for this. Expected energy consumption of the household and of loads for which the Sunny Home Manager receives measured values of the power consumed via radio-controlled sockets or via direct communication. The Sunny Home Manager determines the anticipated energy consumption in accordance with the consumption forecast based on the "learned"
The feed-in tariff and the electricity tariff must be set for this. The optimization target indicates whether the Sunny Home Manager should prioritize ecological- or economical factors during load management. The inverter strings must be configured for this. 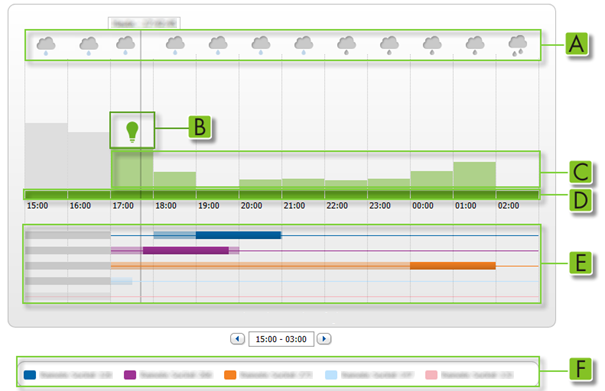 The Sunny Home Manager determines the PV power that can be expected in each case using the weather forecast for the selected location and the "learned" behavior of the PV system. D Tariff for the electricity purchased from the utility grid. If you have only entered one electricity tariff, green is always displayed. The configured time periods are shown as colored, semi-transparent bars. Time periods in which the loads were actually in operation are shown as colored, solid bars. The legend shows which color is assigned to which load in the time period view (E). Tip: Click the diagram, hold down the left mouse button and move the mouse to the right or left. This way you can select a different time period.